To start, you need a new version of SimplePHPApp that uses a back-end data store. With AWS OpsWorks Stacks, it's easy to update an application. If you use a Git or Subversion repository, you can have a separate repository branch for each app version. The example app stores a version of the app that uses a back-end database in the Git repository's version2 branch. You just need to update the app's configuration to specify the new branch and redeploy the app. In the navigation pane, click Apps and then click edit in the SimplePHPApp row's Actions column. This setting indicates the app's repository branch. The first version of SimplePHPApp didn't connect to a database. To use a the database-enabled version of the app, set this value to version2. This setting specifies your app's root folder. The first version of SimplePHPApp used the default setting, which installs index.php in the server's standard root folder (/srv/www for PHP apps). If you specify a subfolder here—just the name, no leading '/'—AWS OpsWorks Stacks appends it to the standard folder path. Version 2 of SimplePHPApp should go in /srv/www/web, so set Document root to web. This setting associates a database server with the app. The example uses the MySQL instance that you created in the previous step, so set Data source type to OpsWorks and Database instance to the instance you created in the previous step, db-master1 (mysql). Leave Database name empty; AWS OpsWorks Stacks will create a database on the server named with the app's short name, simplephpapp. Then click Save to save the new configuration. After you update an app, AWS OpsWorks Stacks automatically deploys the new app version to any new app server instances when you start them. 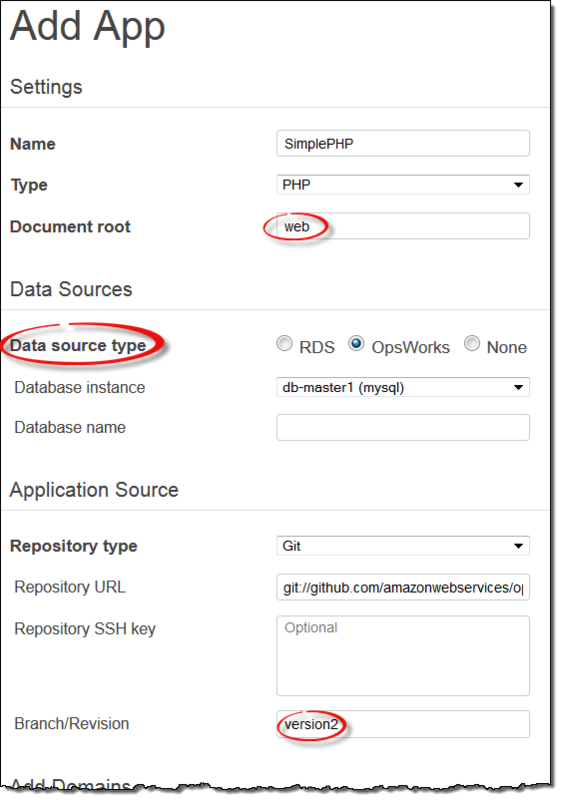 However, AWS OpsWorks Stacks does not automatically deploy the new app version to existing server instances; you must do that manually, as described in Step 2.4: Create and Deploy an App - Chef 11. You could deploy the updated SimplePHPApp now, but for this example, it's better to wait a bit.